Yesterday, my four-year-old granddaughter, Heather, blessed my heart. We'd been spending the day together while her Mommy and Daddy enjoyed some much needed time together. As they began their mid-day date, Heather and I were in the process of making Christmas cookies. What fun it was to help her mix up the flour, sugar, eggs, butter, and vanilla. Of course, there was a dusting of flour on both of our noses by the time we got through, but we didn't mind. Then, we allowed the dough to firm up a bit while we went outside to swing. Her excitement was uncontainable. When it was time to come back inside, we enjoyed a little snack and then pulled out the dough and began to get busy. As we worked to roll out the dough, Heather said, "Gigi, this is like ta-doh." (That's her word for Play-doh) I agreed and soon we had the dough flattened and ready to cut into shapes. I'd placed a variety of cookie cutters on the counter and allowed her to choose the ones she wanted to use. She had great fun pressing the metal cutters deep into the soft, pliable dough. I watched with delight as she carefully cut and placed each cookie onto the pan then decorated them with colored sugar sprinkles. When the pans were full, we slipped them into the oven and I encouraged her to go play while I cleaned up the kitchen. As I was busy washing the dishes and putting things away, I heard Heather talking. I listened carefully to see what she was saying and this is what I heard - "Don't cry, baby Jesus! It's okay." At that, I had to peek around the corner to see what she was doing. 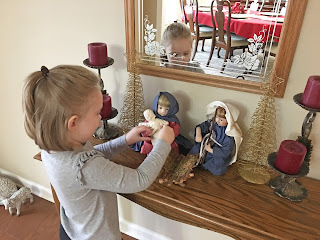 Standing in the foyer, in front of the nativity scene, Heather had picked up the porcelain doll figure of baby Jesus and was tenderly holding him. I continued to watch and listen as she took the small figurine and lovingly placed him into Mary's capable hands. After she'd gotten them positioned perfectly, she stepped back, looked at her work and said in her sweet little voice, "There." She just stood there looking at the figures for several minutes and then ran into the living room to play with her toys. When she was fully engulfed in what she was doing, I tiptoed over to the nativity scene to take a photo. I couldn't help but smile as I saw baby Jesus exactly where he should have been, safely and securely in the arms of his earthly mother, Mary. There, I was reminded of a verse of Scripture - " And she will bring forth a son and you shall call his name Jesus." Heather knew, without me telling her, that the baby's name was Jesus. Her Mommy and Daddy have taken time to teach her well and even though she doesn't fully grasp all His Name entails, I'm sure she understands He's very special. The Bible tells us that children were very special and dear to Jesus. In the New Testament, we're allowed to witness a scene as Luke describes the event: "People were also bringing babies to Jesus for him to place his hands on them. When the disciples saw this, they rebuked them. But Jesus called the children to him and said, Let the little children come to me, and do not hinder them, for the kingdom of God belongs to such as these. Truly I tell you, anyone who will not receive the kingdom of God like a little child will never enter it.” We learn in this passage that Jesus loves children and he considers their innocent faith a necessary part of entering into His kingdom. Although Heather doesn't yet understand the importance of the nativity story, in her little heart, she determined that Jesus was upset and needed comfort. 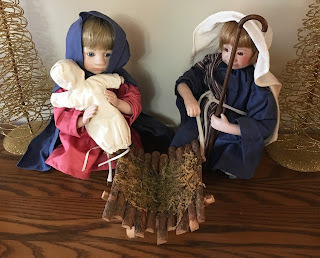 When she took Jesus from the manger and carefully placed him into his Mother's arms, she instinctively knew that was the best place for him to be. And I loved how satisfied she was with herself after she'd completed her task. That one word, "there," spoke volumes to me. She knew beyond a shadow of a doubt that Jesus was okay and that everything was exactly as it should be and that's how she knew she could walk away and not worry about baby Jesus anymore. Of course, we know, we never have to worry about Jesus! He is always okay and constantly keeping watch over us with His loving-kindness, and Heather will learn that one day, too. But, she did teach me a sweet lesson about childlike faith and she reminded me of its importance.